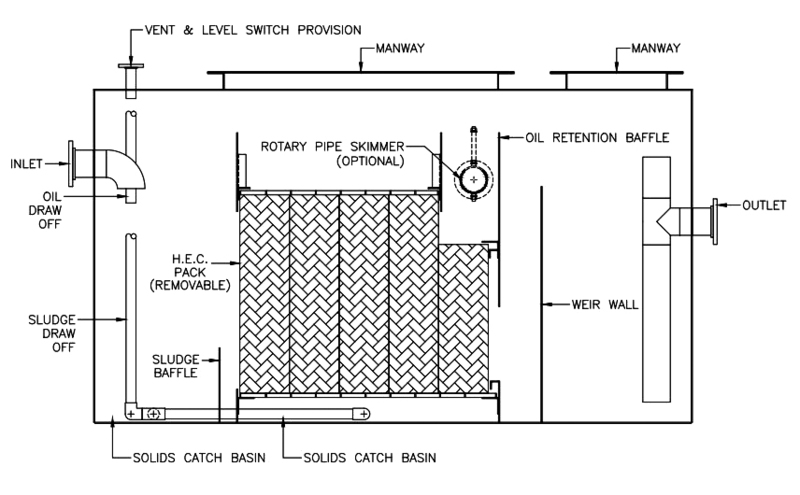 OWS TECH’s SF-HF Series oil water separators are design specific and meet or exceed today’s strict discharge limits. Our performance proven separators come in stainless steel or carbon steel epoxy coated and use a unique high efficiency coalescer (HEC) pack to remove free non-emulsified hydrocarbons with a specific gravity less than 0.95. Our (HEC) packs unique random tube matrix flushes solids and removes oil droplets down to 20 micron size with an effluent discharge quality of 10 ppm or less. The SF-HF Series by design has a low maintenance factor and is easily serviceable due to its large manway access openings and light weight removable (HEC) packs. Flow rates range from 150-2000 GPM thru a single unit and larger flow rates can be accommodated with multiple units. With an extensive line of standard products we’re sure to have one that meets your specific application. Can produce effluent down to 5ppm or less with optional (HPF) pack. Control panels, level switches, freeze protection packages, pump packages, and OSHA approved handrails.